First up in our list of Shows To See This Week is a new weekly series at the Market District Kitchen & Bar, on the second floor of Market District Supermarket, 2250 E. Main Street in Bexley. 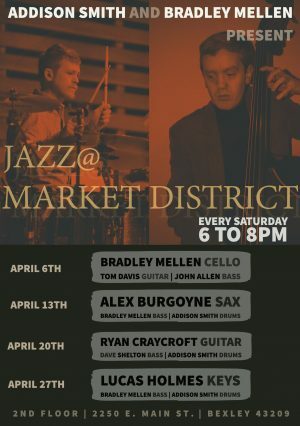 Already the home of Doug Neel’s jazz guitar brunch on Sundays, this intimate spot now hosts the Jazz @ Market District series on Saturdays from 6 to 8pm starting in April. Organized by cellist/bassist Bradley Mellen and drummer Addison Smith, the pair has already scheduled six weeks of trio performances featuring a selection of Columbus’ finest musicians. The series gets underway on April 6th with a lineup of Mellen on cello; Tom Davis, guitar; and John Allen, bass. Future weeks bring Alex Burgoyne, Ryan Craycroft and Lucas Holmes to the cafe – check out our calendar for more details. Keep reading for info on Richard Lopez’s Blue Note Tribute and the Otterbein Spring Jazz Showcase! Sunday, April 7th (3 to 5pm): Richard Lopez Jazz Masters Sessions Presents The Blue Note Years: A Journey of Innovation; A Voyage of Discovery at Columbus Museum of Art. This month pianist Lopez’s evergreen series of themed concerts drawing from the best musicians of Columbus and beyond gets into the timeless sound of Blue Note Records in the 50’s and 60’s. This journey through some iconic material will be guided by an all-star band that includes Jim Powell on trumpet, Randy Mather on tenor sax, Roger Hines on bass and Aaron Scott on drums! The afternoon will highlight tunes from Thelonious Monk, Miles Davis, Bud Powell, Lee Morgan, John Coltrane and more. Tickets and more info are available here. Thursday, April 11th (8 – 10pm): Otterbein Spring Jazz Showcase at Riley Auditorium at the Battelle Fine Arts Center, Westerville. This annual concert presents the hard work of the aspiring students of the Otterbein University Jazz program. This year’s concert will feature the Otterbein University Jazz Ensemble and the (Doug) Neel Combo. “The program will include music from the libraries of Stan Kenton, Charles Mingus, Count Basie, Stevie Wonder, Tom Delaney, Edu Lobo, Dizzy Gillespie, Duke Ellington, and others.” This event is free and open to the public. Seize the chance to hear some new talent play classic material in a lovely theater. More details here.